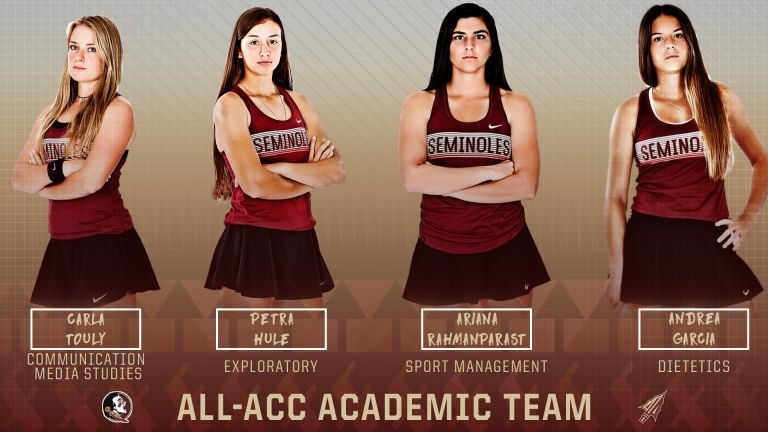 TALLAHASSEE, Fla. – Florida State’s Andrea Garcia, Petra Hule, Ariana Rahmanparast and Carla Touly have been named to the All-ACC Academic Women’s Tennis team. All four student-athletes have been named to the team for the first time. The four members on the All-ACC Academic Team are tied for the most of any team in the conference. Florida State led the league with four honorees, while Louisville also had four honorees. Duke, Miami, Notre Dame and Virginia Tech each had three honorees. North Carolina Syracuse and Wake Forest both had two selections and Boston College, Clemson, Virginia, Pitt, Georgia Tech and NC State had one. The Seminoles earned a team GPA of 3.501 for the spring semester. Andrea Garcia was selected to the All-ACC Academic Team for the first time. She was 19-5 in the spring with a 10-3 record against ACC opponents. She was named ACC Player of the Week after clinching the first win against Florida. Garcia is pursuing a degree in Dietetics. Petra Hule was named to the All-ACC Academic Team for the first time. She also earned All-ACC second team honors after an 18-8 record in the spring with most of her matches on court two. She was 11-3 in the ACC and earned ACC Freshman of the Week after Florida State’s first win over Florida this season. Carla Touly was named to the All-ACC Academic Team for the first time. She also earned All-ACC first team honors after an 18-10 record in the spring with most of her matches on court one. Touly qualified for the ACC Singles Championship in which she made it to the round of 32. Touly is pursuing a degree in Communication Media Studies. Ariana Rahmanparast was named to the All-ACC Academic Team for the first time. She went 15-8 in the spring with an 8-4 record in ACC play. Rahmanparast is pursuing a degree in Sport Management. Duke senior Sam Harris was named the ACC Women’s Tennis Scholar-Athlete of the Year.